The greatest weakness of a fat cat is Three Chords and the Truth. One of three vague main categories of music, alongside Classical Music and pop. The easiest way to understand the differences between the three would be; in Folk Music, the author is often ambiguous, and music is often distributed by rote; Classical Music refers to the tradition of music being performed from the score; and Popular Music refers to the tradition of music being played from recordings to reach a wide audience. Despite it being the oldest category of music out there, no one seems quite sure what folk music really is, or if it even constitutes a proper genre. To many modern commentators, it is any music played by a lone singer-songwriter with a guitar, three chords and the Truth. Except, of course, when it's played by a band, with complex arrangements, and there are no acoustic instruments in sight. To understand what folk music is and the kind of genres it covers, it is best to look at the history of the term. It is derived from folklore; i.e., the culture, traditions and customs of agrarian and working-class society. According to its original definition, it was distinguished from classical (or "art") music and popular music. The main characteristics of folk music were that it enjoyed mainly local popularity and was played by non-professional musicians. Later, it became largely synonymous with traditional music; i.e., songs that had been handed down orally for many generations and were still known to some segments of the population—and weren't part of one of the newfangled musical genres (like Tin Pan Alley, music hall, ragtime, or Jazz). In this context, it was soon used to describe music that was peculiar to a particular part of the world and that did not fit the mold of academic or popular music. World Music is now the more commonly used term for this category. In the British Isles and North America, a renewal of interest in folk music took place between the 1890s and the 1960s. As singers such as Woody Guthrie and Lead Belly led the scene during The Great Depression, it culminated in the American folk music revival, which began in 1948 with the rise of Pete Seeger and the Weavers. 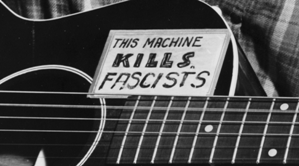 There was something of an interruption during the Red Scare of The '50s, since even playing a guitar was grounds for suspicion for communist sympathies, and some of the major figures like Pete Seeger and Ewan MacColl openly identified as socialists. However, the revival continued into The '60s with the likes of Joan Baez, Bob Dylan, Peter Sarstedt and Phil Ochs. Although all these musicians, from Guthrie through Dylan, drew heavily from tradition and were well versed in ancient ballads, it was at this point that many of them began to write their own material, addressing highly relevant political issues of the day; some of these songs had enough universal resonance to become standards themselves. Folk music became strongly associated with progressive politics and the Civil Rights Movement. A similar movement took place in Britain and Ireland, with perhaps a little more focus on the traditional aspect (although especially in Ireland, singing traditional songs itself is a political act). It was from this Folk Revival that a new conception of folk emerged. Bob Dylan, the major breakout figure of the movement, soon abandoned politics in favour of more poetic, introspective songs. In 1965, he released two albums- Bringing It All Back Home and Highway 61 Revisited that blended folk music with blues rock. In the same year, The Byrds released their hit single "Mr. Tambourine Man", a Dylan cover, which brought a pop-influenced upbeat and rhythmic element to the song. Bob Dylan and The Byrds were now the Trope Makers of a new genre: Folk Rock. From folk rock emerged Psychedelic Folk, Indie Folk and countless other genres. While it ultimately derived from the Folk Revival, folk music was not a classification anymore, but a particular style of music influenced by the one that emerged in The '60s. It is a popular genre, if a somewhat alternative and underground one, to this day. This is only one narrative drawn from the history of folk. Along the way, its many subgenres and regional variants spawned Blues, Country Music, Bluegrass, Folk Punk, Folk Metal and some of its elements incorporated into Slowcore. Depending on which definition you use, all music was at some point derived from folk. Before there were Bach and Beethoven, before The Beatles and The Buzzcocks, there were a few lone singers and instrumentalists who made songs purely for the love of it. Around the 80's a genre called antifolk emerged, the shtick being subversion of the earnestness of 60's style folk, mocking pretension and seriousness and often being raw and experimental. Its definition is as loose and broad as folk itself. An example of a band influenced by this is the Mountain Goats. European musicians, particularly in Eastern Europe, have followed in exploring their own folk traditions through the use of electric or electronic instruments. This music tends to be more traditional and folklore-orientated. However, the "sung poetry" genre in the Baltic States and Poland also focuses on setting the works of national poets to music. Other movements include "turbofolk", which had Unfortunate Implications in Serbia, where it was largely sponsored by the Milosevic clan, particularly Mira Markovic. Perhaps all this confusion is best summarised by a quote from Louis Armstrong: "All music is folk. I ain't never heard no horse sing a song". Absence Makes the Heart Go Yonder: Occasionally subverted by the woman who does wait and then double subverted by her lover in disguise who tests her by trying to woo her away from her promise. Always Murder: Too many murder ballads to count! Bawdy Song: Probably as many of these as murder ballads, if not more. Determined Homesteader and related tropes, sometimes used ironically. Your Terrorists Are Our Freedom Fighters: Applies especially to IRA songs, but most outlaw ballads and a few protest songs also fit. Björk: Recorded one album almost entirely in a cappella, with lots of throat singing. Her other albums sometimes include folk elements, too. Leonard Cohen - Very good writer, less good singer, gets covered frequently as a result. Jim Croce - With elements of blues, country, and pop. Ergyron - Chukchi (Russian Eskimo) song and dance ensemble. The Grateful Dead: From the 1970s on. Namgar - the best and only Buryat-Mongolian folk-rock fusion band. Sinéad O'Connor - Known for her folk-rock, along with various other genres. Natalia O Shea - Russo-Celtic folk-rock. Anette Olzon - She's better known for her work in Symphonic Metal bands, but her two solo albums are a mix of folk rock, Alternative Rock, and Indie Pop.